Description: PLEASE READ - Older packaging Circa 2005 Non- Mint. Package may have small veins, crease, soft corners, yellowing on blister. 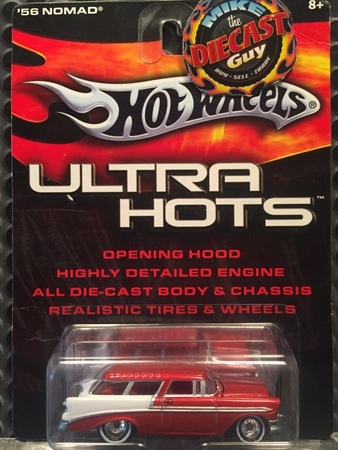 HOT WHEELS HAVE OVER 1000 ITEMS LISTED ON THE TTP - PLEASE TAKE A LOOK FOR ADDITIONAL ITEMS ALL REASONABLY PRICED MANY HARD TO FIND AND MAXIMIZE YOUR SHIPPING COST If you are buying more than one item please select but DO NOT PAY FOR EACH ITEM--I WILL SEND YOU A PAY PAL INVOICE WITH COMBINED ITEMS or MO TOTAL. I combine shipping for multiple purchases. WILL SEND YOU A PAY PAL INVOICE WITH COMBINED ITEMS. ALSO, Please take a look at my other items will combine or discount shipping for multiple purchases. Prompt payment appreciated. Please read INTERNATIONAL customers DO NOT PAY FOR ITEM(S) PLEASE WAIT FOR INVOICE WITH INTERNATIONAL SHIPPING CHARGES - I ship USPS Priority only NO EXCEPTIONS e-mail for pricing. Questions please email to mikecolasurdo@ca.rr.com.